Click here to listen to the recording of the show. 1.Twitter expands its commerce lineup with Twitter offers : With the build up to the festive season, Twitter is trying its hand at eCommerce by introducing “Twitter offers” which lets retailers tweet special cash-back deals that users can then redeem in brick-and-mortar stores. The idea is that you can link your credit card to Twitter, and then, after you click on one of these online coupons, you can automatically redeem it when you use than same credit card in the associated store. 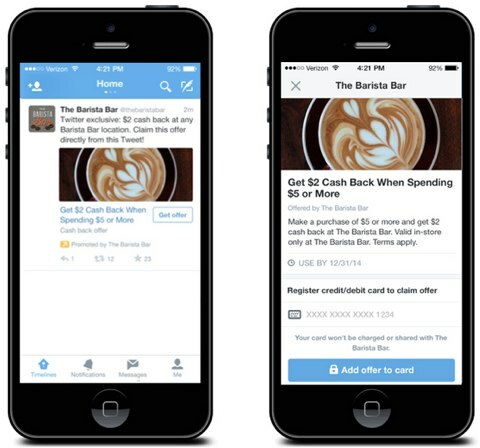 Initially, Twitter will earn a cut from the Twitter Offers tool by charging businesses to promote their offers on its timeline. Although on the surface this seems like a clever idea, it is unclear whether this will actually work as the customer experience is far from a seamless one. The user has to link their credit card to their twitter account, then redeem the coupon offline (in a store), and then wait for the redemption to reflect on their credit card later. Customers prefer instant gratification and retailers need to also work out a strategy to drive customers back to the store. The decline of Groupon has also shown that online coupons are not necessarily the silver bullet in winning loyalty. Recently Twitter tried out a campaign with Amazon whereby it automatically pushed products into the Amazon.com’s shopping cart by using a special #amazoncart hashtag , but stats have not revealed how many people have been actually buying the products. 3. Studies find that the iPhone 6 and iPhone 6plus are shifting readers away from their ipads. When Apple introduced the larger sized iPhone 6 and 6 Plus devices a few months, it seemed natural that larger screen phone devices would lead consumers to shift their iPad consumption patterns to the phone. Now, data collected from a “save for later” reading app called pocket has indicated that this is indeed true (collected from a sample of 2 million articles that were opened), where behaviour was compared specifically for users who upgraded from the iPhone 5 and 5s to either an iPhone 6 or p Plus to see if there was an observable change. From this data it was found that 72% of reading time is now on the smartphone and just 28% on the iPad. This data could be slightly skewed by the early excitement that comes with any new device, however this is the first time that new iPad sales have reached an all time low so it is worth monitoring this behaviour over time. From hands on experience I can definitely say that I am one of those users who spend probably 75% less time on my iPad now that I have an iPhone 6 Plus as from a productivity point of view, the 6 Plus is just more convenient. 4. Dropbox has recently integrated with Microsoft office 360. Earlier this month, Dropbox and Microsoft announced a partnership that would see Dropbox offer better support for Microsoft’s Office Suite, including the ability to edit Office docs from the Dropbox mobile app among other things. Last week, those integrations have gone live for users of both the Android and iPhone Dropbox applications. Dropbox explained that users can now edit their Office files when they’re “on the go,” editing them directly from the Dropbox app and accessing the files directly from the Office apps. To use the new feature, you’ll first need update your app to the latest version, then open any Office document, spreadsheet or presentation that’s stored in your Dropbox. From here, a new “Edit” icon will be available that will allow you to switch over to the office 360 apps to make changes to the file. When you’re finished working, those changes will be saved back to Dropbox automatically. The Dropbox/Microsoft partnership is an extensive deal aimed at increasing collaboration between the two firms, and may have surprised some given that the two companies offer competing products. Microsoft has a Dropbox-like service called OneDrive, but Dropbox’s larger service reaches hundreds of millions of users, including 80,000 businesses. The deal has four main parts: Quickly editing Office docs from the Dropbox mobile app; accessing Dropbox docs from Office apps; sharing Dropbox links of Office apps; and the creation of first-party Dropbox apps for Microsoft’s mobile offerings. 5. Tumblr overtakes Instagram as the fastest growing social media platform. Tumblr, the microblogging platform owned by Yahoo!, has overtaken Instagram to become the fastest-growing social network in the world, according to a new global study. Research from GlobalWebIndex, based on a sample of more than 40,000 users across 32 countries, established that Tumblr increased its active user base by 120% in the last six months while its membership grew by nearly half (45%). It was followed by Pinterest, the visual bookmarking site, which increased its active users by 111% and its membership by 57%. Instagram, the photo-sharing platform, was ranked third after increasing its active users by 64% and its membership by 36% while LinkedIn, the professional networking site, recorded growth in active users and membership of 54% and 27% respectively. By contrast, Facebook increased its active user base by only 2% and its membership by 6%, although with 1.35 billion active monthly users it remained by far the largest social network in the world. Perhaps of more concern for Facebook, however, is the research finding that 50% of its members in the US and the UK are using it less frequently than they used to, rising to 64% among teens. Close to a half (45%) said they were simply less interested in the site – a view shared by 54% of teens – 37% said they’re bored of it and 18% said it’s just not as “cool” as it used to be. While the report made clear that Facebook has some major challenges to face, a more positive finding for it was that internet users have just become more active across multiple networks and the social media user now prefers more specialised apps. App of the week: Zinio (available on iOS , Android, Windows Phone and BlackBerry ) This is one of my favourite magazine apps that has access to over 5500 magazines (the world’s largest newsstand) on your mobile device. It is subscription based, where you pay a monthly subscription and the magazine appears in your library on the app , or you can make once of single issue purchases. There are also a variety of articles which you can read for free. This app is my all time favourite and I’ve been using it since 2010 and what I love about it is that its kept fresh, the UI is always updated in line with the latest OS and the user experience has always been pleasant. I love the instant gratification of purchasing and immediately downloading a magazine whenever I want one and it certainly cost effective and green friendly. Magazine sizes are quite large so its best to download over a wifi network.